Comments: Condition Acceptable: Comment: Book is used and in acceptable condition. This may include heavy wear on cover and pages, highlighting/writing on pages, staining, and moisture damage (rippling/warping). All orders ship via FedEx SmartPost. (Please note shipments to Hawaii and Puerto Rico Can take up to 30 days.) Thank you for shopping with Goodwill Industries of the Inland Northwest changing lives through the cycle for good. STUDENT edition textbook. Monoclonal Antibodies now have applications in virtually all areas of biology and medicine, and much of the world's biotechnology industry has its foundations in the exploitation of this technology. The Third Edition of this well established book meets the needs of both newcomers to the area and experienced researchers, by providing an integrated treatment of both the production and application of monoclonal antibodies. As in previous editions, detailed and critical accounts of the theory, production, purification, fragmentation, storage and radiolabelling of monoclonal antibodies are given, along with descriptions of their use in antigen characterization, affinity chromatography and immunofluorescence. The present volume has been comprehensively updated to cover recent rapid advances, particularly with respect to the applications of molecular biology, the use of antibodies in closing and heterologous expression of genes, immunohistology and phage display libraries. Since the previous edition, there has been a growing trend towards the replacement of procedures using radioactive isotopes, and the current edition incorporates these newer technologies. The text is oriented towards problems solving, and makes it easy to adapt each procedure to individual needs. Extensive cross-referencing, a glossary and a comprehensive index make this book an essential reference. This book will be vital both for laboratories already producing or using monoclonal antibodies, and for workers in many disciplines who are contemplating their use. * * Provides an integrated treatment of both the production and application of monoclonals in cell biology, biochemistry, and immunology. * Gives detailed and critical accounts of the theory, production, purification, storage, and relabelling of monoclonals, and their use in antigen characterization, affinity chromorography, and immunofluroscence. 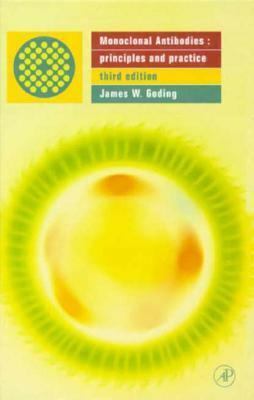 * Comprehensively updated to cover the rapid advances that have occurred since the publication of the Second Edition.Goding, James W. is the author of 'Monoclonal Antibodies' with ISBN 9780122870231 and ISBN 0122870239. Loading marketplace prices 119 copies from $41.90 How does the rental process work?